Boo has been working through Fun-Time Phonics!™ Software – 2-PCs Win Download from The Critical Thinking Co.™ which we received to review. 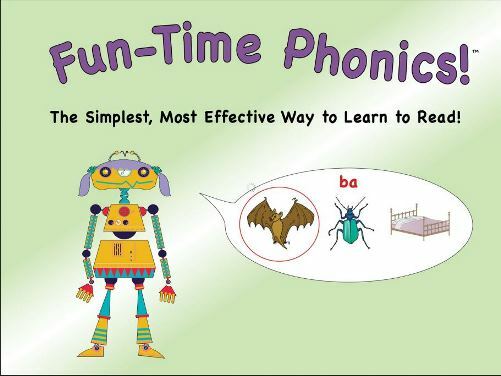 Fun-Time Phonics!™ is a downloadable software designed to help kids in pre-k through second grade learn to read. The software works on Windows Desktops. The product we received can be put on up to two computers and used by one person at a time, but you can create multiple users. It is designed to be a comprehensive reading program that’s also fun and engaging. As indicated by the name, it takes a phonemic approach to teaching children to read. Fun-Time Phonics!™ is also part of the Reading, Writing, and Arithmetic Before Kindergarten!™ software bundle of 5 Apps For Less Than $40. Boo has been working through this program, beginning with section one that introduced beginning and ending sounds, vowel sounds, and rhyming words. I immediately noticed her making great progress in saying a word slowly and being able to discern the beginning and ending sounds for the first time. The activities very quickly progressed from simply helping her pick out the correct beginning of ending sound to giving more challenging options. For example, when trying to select a word with the same ending sound as bed she had to choose between dish, radio, and mad, being careful to not only listen for d but also make sure she didn’t select an option besides the d as the ending sound, which sometimes tripped her up, especially when she had just been working on beginning sounds a few minutes before. There were also super tricky pages like choosing between shade, dive, and crab. So Boo had to not only remember that she was listening for the ending sound now, not the beginning, but also not confuse the sound b with the d sound. Other examples of tricky pages included not confusing th and f or b and p which even I had a really hard time telling apart just by listening to the sound I heard when she clicked the speaker. These tricky options tripped her up enough that she didn’t pass the ending sounds lesson the first time and had to re-do it. On her second time through she had the exact same questions so she was able to remember which options she had chosen before and choose a different one instead, so I’m not sure if she actually gained any greater mastery or not, but she did pass the level and get to move on to a lesson where she had to find the two words that had the same beginning sound (and later, the same ending sound). She once again failed the first time and had to repeat the lesson which was the end of her having any desire whatsoever to use the program. From then on it was a huge fight to get her to do the lessons, and now that our review period is over I’m going to let her take a break from this program. Despite a promising start, Fun-Time Phonics!™ just isn’t the right fit for Boo at this time. I imagine a child who is already confident with discerning the beginning and ending sounds of words would find the more challenging exercises to be good practice. Despite tons of work all of last year to try to help Boo learn to read, she’s really just now recognizing a handful of sight words and making good progress with sounding out simple words like cat and dog. I hope this program might be beneficial to her a little later on after we’ve nurtured her tiny little budding confidence for awhile so that it’s not so quickly crushed by things like not passing the lessons on her first try. Be sure to check out what other reviewers think of this program as well as other products from The Critical Thinking Co.™ over at the Homeschool Review Crew link-up. ← Stocking Stuffers your kids will still love after Christmas is over!